This EVS is a 8 months duration and runs every year from the beginning of March till the beginning of November - we expect you to commit fully to the entire season. Sekier, our farm, is part of Zajezka Ecovillage, situated In the rolling hills of Central Slovakia. We are at 800 m above sea level, on a beautilful meadow surrounded by decidous mixed forests, with only a dust road access. We are a starting educational Permaculture site and working farm. Our main goal is regenerating soil with animals and perennials, sharing our knowledge with others and building a community of families and individuals that live off our 20 ha property. We grow vegetables and fruits in a No Dig Garden and orchard that provides food to the farm members, short-term volunteers, guests and workshop participants. Sekier is also a meat-producing farm. We graze animals and eat extremely good quality pastured meats, dairy, eggs and vegetables. 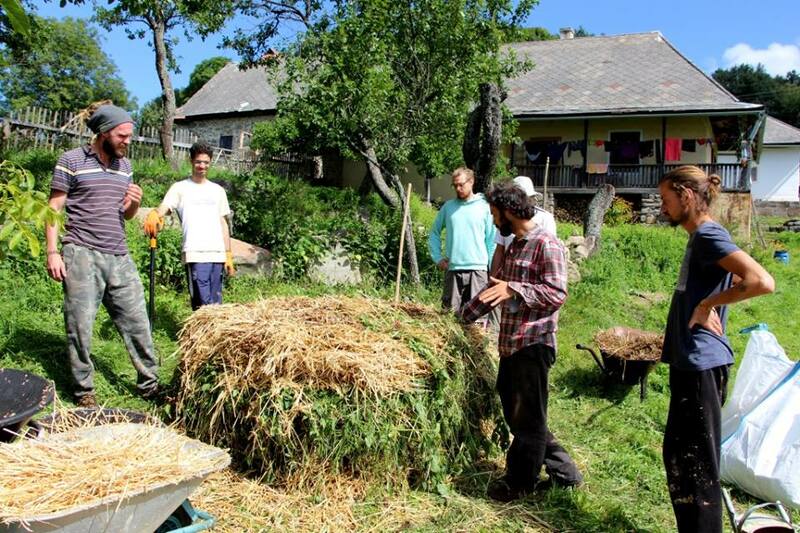 We organise and host workshops on permaculture and traditional crafts about once per month. Apart from that, we host larger educational events and camps during the summer, as well as celebrations and informal gatherings of the local community. What would you participate in? You would be involved in all aspects of the farm life, helping with its development and maintenance, instructing visitors and cooperating with short-term volunteers. When helping to manage the garden and orchards, work includes bed preparations, transplanting, direct seeding, harvesting, irrigation, weeding and maintenance. We have Broiler chicken tractors, an egg mobile for hens, a small herd of sheep and goats, as well as a couple of mini cows and veteran horses. From daily moves to feeding and monitoring, you'd be working with the animals within our Holistic Planned Grazing schedule. These are all very physical roles which involve hauling broiler field pens, feeding animals, moving electric fences, hand milking and all other duties connected with the animals. You will need to enjoy being outside at every weather when necessary. You will be involved in our ongoing natural building projects, learning how to work with wood, straw and clay, using hand and power tools, working both on the Sekier farm as well as in other places of the local eco village community , cooperating with locals and short-term volunteers. During this EVS, you would help finishing a strawbale house with clay plastering and wood works in the interior, you would also help with the carpentry work of a new summer kitchen and help building an outside cooking stove. You will learn how to ferment, dry and pickle to preserve harvest. You will learn how to produce nutricious food from scratch (baking sourdough bread, making cheese and joghurt, butchering) managing a farm household with guests and other short-term volunteers. What can you get from this EVS? This EVS is going to be a valuable experience on multiple levels. Following the whole growing season on the farm - seeing the plants, the animals and people reacting to the changes of weather and light will be very enriching. You might be outdoors the whole day, every day and learn to become aware of your surroundings and the impact you have. You will be working in an international team, finding the dynamics to work together efficiently. This EVS will give you confidence to start a self-sufficient farm project yourself in the future, experiencing how wonderfully work, community and free-time can merge together into a meaningful life connected to nature. What do we offer and what do we expect? We are looking to support people who want to go into farming, designing sustainable systems, learning to cater for themselves, as well as getting experienced with organising groups and educational events. Because in this project you will be learning by doing, you will need to enjoy physical work and have the “get it done” attitude. You need to be pro-active, communicative, teachable, positive solutions focused, dependable and take responsibility for what you are managing. 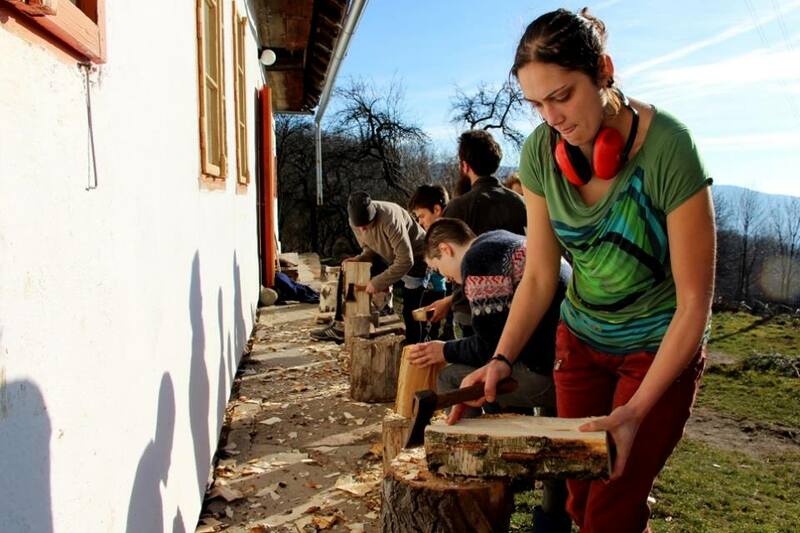 We are looking for participants that are pragmatic and that want to do things with their hands, learn how to use hand tools and develop their craftmanship. Your learning will depend on your motivation and willingness to take responsibilities for tasks. During this EVS, you will participate in a 72-hour Permaculture Design Course, certfied through TreeYoPermaculture. Apart from that, you will participate in various craft workshops and teambuilding trips. You will also receive Slovak lessons that will help you to get more easily involved with the locals. We work about 35 hours every week, and it's often times physical work. In the summer months we get up with the sun (which can be as early as 5 a.m.) have a siesta during the peak of the day and then resume working in the evening hours. Weekends are relative down time although we all carry animal duties and basic chores over the weekend. As you will share a farm household with at least 5 other volunteers and short-term guests, you need to able to get along with others. Where to apply for this project?. The deadline for applications is February 3rd, 2017. Interview with Miroslav Kašiak (Mirec), leader of the civil association Society for Harmonious Living (Pospolitost´ pre harmonický život) discussing life in Eco-community Sekier.